Well-being. For them. For life. 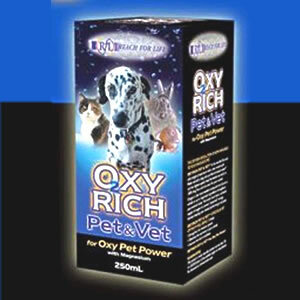 Oxyrich Pet & Vet is a oxygenated solution designed to enhance the health and general well-being of your pet. By delivering a high dose of bio-available oxygen direct to the bloodstream, it promotes a longer, more active life and it does it safely, naturally and completely free of chemicals or toxins. What is Oxyrich Pet & Vet? Oxyrich Pet & Vet is an oxygen boost to the bloodstream for domestic animals including dogs and cats, designed as a general enhancement to their health and well-being. Non-toxic, drug-free and pH balanced, it uses the restorative powers of pure diatomic oxygen to resist the detrimental effects of age, stress, illness and transit travel. It comes in the form of an aqueous water and saline solution, containing a minimum of 5% (50,000 parts per million) of usable oxygen, compared to the 6-10ppm found in tap water. The remaining ingredients are .021% Atlantic sea salt and de-ionised water to 100%. Which pets is it for? Oxyrich Pet & Vet is suitable for most common domestic pets, especially dogs, cats and rabbits, with dosages varying according to bodyweight. If you are unsure if Oxyrich Pet & Vet is right for your pet, please contact us. The benefits of a concentrated oxygen dose are many and well documented. Most importantly, Oxyrich Pet & Vet counters the negative effects of oxygen deficiency by delivering high levels of bio-available oxygen to the bloodstream. It helps pets recover live a healthier, more active life. It is a proven aid to recovery from moments of physical weakness, muscle fatigue, flat and listless periods or minor injury. A regular serve of Oxyrich Pet & Vet promotes health and well-being and stimulates the metabolism to process out toxic contaminants. It restores a zest for life, tops up energy levels and strengthens resistance to illness. Oxyrich Pet & Vet should always be administered orally using the pipette provided. Some owners choose to mix it with water but it has to be a 10:90 mix, i.e. 10ml of Oxyrich Pet & Vet and 90ml of water.